Gift Vouchers are available for as little as £5, up to any amount you wish to purchase, in denominations of £5 (ie. £5, £10 or £25+). Gift Vouchers are available for as little as £5, up to any amount you wish to purchase, in denominations of £5 (ie. £5, £10 or £25+). They can be offset against the full value of any my services as well as the Equisentient Coaching Cards. Why not treat a friend to this unique and special experience? 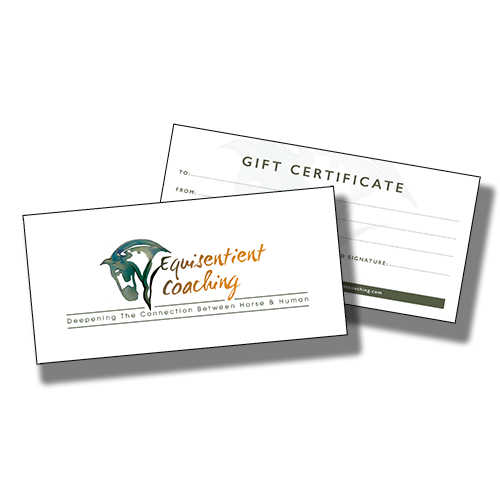 Or, if you’d love to connect with your own horse in this way, or you’d like your own set of Equisentient Coaching Cards, simply suggest the Gift Vouchers to someone asking what you’d like this year. We’ll even post Gift Vouchers for you, for free, to any UK address. If you want a gift voucher for, say, £30, simply add a £25 and £5 voucher to your basket.